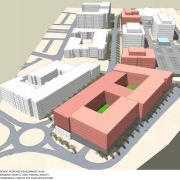 Of three buildings proposed in Rockville’s Park Potomac development, one is expected to contain multi-family residences with ground floor retail while the other two will have either residences or commercial space with ground floor retail, according to Planning Board documents. 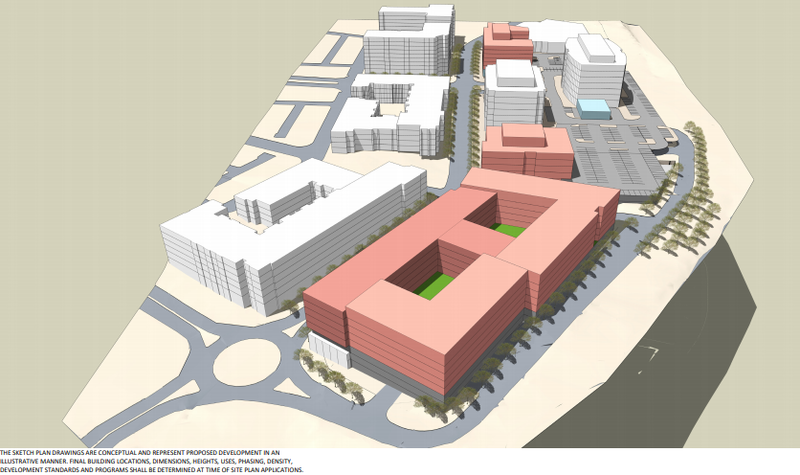 A three-building project with more than 650,000 square feet of housing and retail space has been proposed for the Park Potomac neighborhood. One building is expected to contain multi-family residences with ground floor retail while the other two will have either residences or commercial space with ground floor retail, according to Planning Board documents. All will sit along Park Potomac Avenue, off Interstate 270 near Montrose Road, and are owned by FP Whitro Westlake LLC, an entity with ties to the Potomac-based Foulger-Pratt Cos.
Foulger-Pratt, which is doing large projects including Rockville Town Center and redevelopment of the former Discovery Communications headquarters in Silver Spring, did not respond to requests for comment. The ground levels of the proposed buildings are expected to have “significant amounts of transparency and highly visible entrances,” as well as sidewalks and landscaping to “promote pedestrian safety, facilitate interactions and create a sense of community,” according to the development application. Future development would continue earlier construction that left unused, but approved, development on the 54 acre property. Roughly 1.7 million square feet have been developed and project leaders seek to add about 660,000 more to bring the total to 2.3 million square feet of residential and commercial space. Park Potomac has 150 townhomes, 152 condominiums, 297 rental apartments and 389,128 square feet of commercial uses. Roughly 20 restaurants, service businesses and retailers adorn the neighborhood, featuring popular outlets such as a Harris Teeter grocery, Elevation Burger, fitness centers, a valet cleaner and wine bar. A shuttle runs twice each hour to and from the White Flint Metro station about 3 miles away. The project also includes a parking garage and more than 10 percent of the space is dedicated to amenities such as parks and open areas. A 21-page document submitted to the Planning Department outlines a system of signs developers hope to implement throughout the community, including plaza flags with a distinguishable logo and posts to direct pedestrians and motorists to parks and parking. Often called wayfinding signage, similar signs are planned for the back entrance to the community and a roughly $10,000 mural to be painted along a stairwell. The plan is scheduled for a public hearing before the Planning Board at the end of the month.